There is only one certain thing about policing the Normanton and Arboretum wards in Derby, and that is the level of unpredictability. As with the majority of deprived inner city areas it has a relatively high crime rate, and a reputation that draws upon people’s prejudices and perceptions. The paradox is that, taking into account the high level of the transient population, the extreme range of cultures and languages, the high percentage of new communities, and extent of relative poverty, then it is a surprise that the crime rate is not significantly higher. So how do you police an area like this? Surely they are constantly arresting people, and managing Home Office bureaucracy? There are 2 Safer Neighbourhood Teams (SNT) which operate from the Pear Tree Police Station under the leadership of Inspector Richard Keene. One for Normanton, and one for Rose Hill ( principally Arboretum Ward). 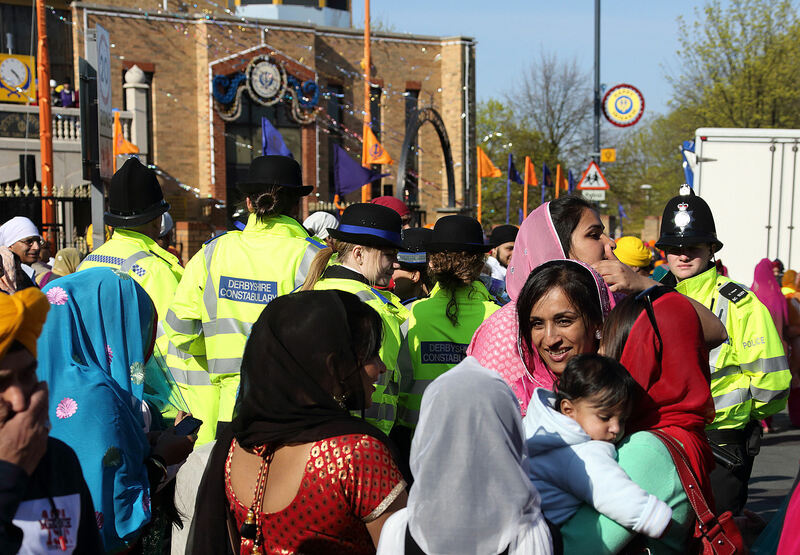 The purpose of the SNT is to work closely with the community and be the visible part of the Police service and operate in a way which demonstrates pragmatism, and supportive co-operation. Whilst there are many police activities that are resourced by the Derbyshire Constabulary ( e.g. co-ordinated investigations, serious crimes, etc) the daily human interaction, and the predominant public face that drives the perception of the Police is the SNT. I had the opportunity to go out “on the beat” with the local Police officers on 5 occasions including one focussed on their approach to prostitution in the area. I wanted to get a sense of how the Police operate in this area, and deal with the variety of issues that they are confronted with. During my time out with PC Rich Barker, we went to the house of an elderly man who had been complaining about perceived intimidation from others, and a feeling of anxiety. Rich had met this man before, and was aware that he had suffered some form of trauma to his skull in the past, and had mental health issues. We were both invited in to his small ground floor flat; he sat on his bed, and he explained his problem. The story was slightly confused, he was talking of strange characters, and explaining about problems with his medication; he also revealed that he carried a knife to defend himself. Rich was listening carefully, trying to assess, and conclude as to how much of what he was describing was true, how much was a result of general confusion, what he should recommend to this man, and what other action he should take. Should he be heavy-handed about the knife, or give him a friendly warning? This man was unquestionably a vulnerable adult; Rich asked questions about his social care, and options for other support. He advised him and gave him comforting words. He took notes, and agreed to make some calls on this man’s behalf. He would return again in a few days to follow-up. Later on, he received a call from the station; a complaint from a local resident about disruption from drunks on Mount Street. It was not clear what the problem was, the description suggested that it might be a significant disturbance. When we arrived it was 5 people sitting on the wall, 4 men and a woman, from the local hostel, drinking and chatting. It was not clear where the friction was. Street drinking is banned in Normanton, and these people knew it, and some of them had been told before. The option existed to warn them, take their cans, and empty the contents down the drain, and be robust about the clarity of the no-drinking restrictions. The judgment call was with Rich. He could see that there was nothing to be gained by being unnecessarily officious, and that they were not causing trouble. He explained the situation calmly, and reminded them of the law, and carefully requested them to move on. The group fully understood his position, and respected that he was just doing his job. The strong implication was – don’t drink on the streets again! But in a civilized manner. One evening I also spent time with PCSO Bakhtawar Rana and PCSO Sharanjit Mahal walking throughout the Normanton/Arboretum streets and through the park. The PCSO role is a fascinating “half-way house” between a police officer and a “good citizen”. They are fully integrated within the Police service, but don’t have the legal power of arrest. It gives them the opportunity to engage with people on a different level, and, for those who recognize the difference with a police constable, facilitates a more open dialogue. I was walking up Princes Street with PC Amanda Fearn ; she turned away from me, and waved at a car, it pulled up, and an old lady wound the window down. This was the woman that Amanda was going to see later in the morning about a concern that she’d raised. The woman apologized that she was going to be out, they shared a few comments, a few laughs, and agreed to meet at another time, so Amanda could make sure that she was ok, and that she understood where they were in following up her complaint. Amanda was new to the area, and was explaining how she felt that a major part of the job was getting to know the communities, understanding what the real issues were, and being in a position where you can make a positive difference to someone’s life. It was an interesting dimension on her role. We briefly returned to the Police station and picked up PC John Anwar for the routine patrol up Normanton Road around midday. A brief diversion around the back of St Thomas’ church revealed the remnants of drug-taking activity, and a few yards along 2 lads were spotted chatting in the front of a car. A sixth-sense suspicion, and a tap on the window, resulted in some questions about drug use. The passenger denied all knowledge. He only had broken English as he was from Eastern Europe. I wondered why John kept challenging them; he asked the young lad to open the door and there in the foot well was a syringe. He was asked to get out of the car – the lad did so. John asked him on several occasions to remove his hands from his pockets – the lad claimed he didn’t understand “ What is pockets?” whilst he was busily trying to crush the tablets. His delaying tactics, which no doubt made sense to someone who was influenced by drugs, was met with some bemusement by John. John and Amanda, proceeded to search the car, bag up the evidence, and call for support to take them to the station for questioning. At that point I left them to their formal duties. The SNT is not an isolated group. They have strong connections with many agencies, organisations and institutions throughout the area. This ranges from the Derby Council Neighbourhood teams, Housing organisations ( Derby Homes, Metropolitan Housing, Derwent Living etc), Youth Offending teams, faith organisations, park rangers, NGO’s and any other interested parties who can highlight areas of potential concern. The daily Tasking meeting in the Police station corrals all of the available knowledge to help guide and influence the priorities for the SNT activity for the benefit of the community. Single Points of Contact are nominated within the SNT to interface with a broad range of people, places and issues. They are established to provide a consistent “face of the Police” and encourage communication. This covers working with schools, scrap metal dealers, local clubs where potential exists for crime, children’s homes, prostitution, Hartington Street, etc. The list could be endless. As any member of the SNT goes out on the streets, the number of variables that they could face during their patrol , must be many times greater than any other part of the City. There is every likelihood that the person that they will be trying to talk to won’t speak English, or whose command of the language is poor, or where people’s behaviours are driven by drugs or alcohol, or where some degree of tension arises because of a clash of cultural norms, or religious rules. It seemed to me that the Police officer on the beat was, in many ways not just a “law enforcer” but a “social worker”, a “friend”, an “enemy”, a “security guard”, an “integrator” and more. But when on duty they were, fundamentally, like a “triage” that had to be agile to any possibility, to decide, in the moment, whether to act, how to act, what to say, and how to say it, whether to refer, and who to, and when…and the wrong decision, at any time of day, and in any circumstance, could make the headlines the next day! This is a small window into the Police operation in the area. Although the 10 – 15 hours or so, I have been walking, talking and listening to them, may not be very long, I sense that it is representative. Everyone, no doubt, will have had a bad experience with the Police, and will gladly repeat their story – that is their privilege. But viewing it rationally, any service of this nature, which has to respond to an indeterminate level of unpredictability, can never be perfect. Referring to the SNT as the “eyes” of the Police can, when viewed cynically, imply “collecting evidence” like a camera. Whereas the “eyes” are about contact and engagement on a personal level through which one truly gets to know someone, and connect with them, and that is the nature of the SNT. That connection with people on the most fundamental of levels is the key to policing the community.